Mad Duck Posters made a really exciting announcement yesterday. 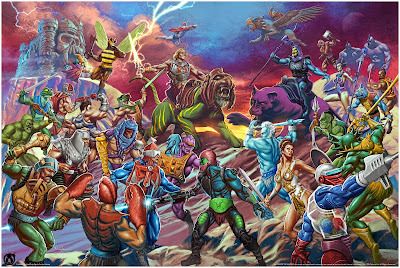 They’ve teamed up with artist Carlos Valenzuela to release a killer, officially licensed He-Man and the Masters of the Universe print! Entitled “The Battle for Grayskull”, this poster captures an epic battle between the forces of good and evil on Eternia. The art, which features He-Man and the Masters of the Universe against Skeletor and his Evil Warriors, includes many classic MOTU characters, including several characters that were previously exclusive to the Filmation cartoon. “The Battle for Grayskull” by Carlos Valenzuela is a 36”x24” Masters of the Universe hand numbered fine art giclee. The Regular Edition will be a timed edition retailing for $100, while the Battle Armor Variant is limited to just 100 pieces and will retail for $125. Both versions will go on sale at noon EST today, Wednesday, April 12th, at the Mad Duck Posters online store. The window to purchase the Regular Edition will end at 12pm EST on Monday, April 17th.